Hello. I'm about to get a Jupiter 4 but I want to make sure I get the first generation with the gritty filter. Serial number 851 207 - Is that the first generation? How can I distingish both versions from their serial numbers? I have not been able to get that information online. Serial no. 851207 should be August '79. This should have revision D module boards, which means it'll have the 4 BA662 ICs in the filter circuit. As for 'gritty', well, I don't know. The IR3109 that appeared later is the same as in all kinds of other Roland kit and is nothing special - just those four 662 OTAs in one body, basically. I think most Jupe 4's will be sounding pretty gritty by this time. Thanks Nathanscrbe, you're a real pro. Respect! but if i told you about it, i'd have to kill you. The JP-4 had many board revisions, and even the later boards had extra components tacked on, it was never a particularly stable synth and was always a work in progress until it was retired. Look for leaking batteries, and the top panel board is extremely fragile, and bumps to the sliders can result in cracked tracks and weird operation due to a cracked earth trace along the top of the PCB. A very nice sounding synth, but just like the Rev 2 vs. the Rev 3 Prophet 5, I would avoid earlier units unless you don't mind lower reliability. I would take the rev.3 any day over the Rev. 2 because I want to be playing the synth, not fixing it, and the same goes for JP4's. A diabolical machine to service, many techs won't touch them, you need an extender card to service the voice boards, and even though I have an extender card and loads of spare boards for JP-4's and Promars, my heart sinks every time one comes into the shop. Not saying this to put you off, I am saying it to encourage you to find a well looked after, late serial number unit. Should be revision E, from around May '81. This was the last revision board AFAIK. In terms of the filter IC, it should be the IR3109, but as Steve points out, other things changed too. oooh, do me next! mine's 891899.
i had no idea there were different eras of them. i do know that i paid over $800 to have mine fully serviced right after i got it tho. yikes. anyway, works/sounds like a dream now. chiasticon wrote: oooh, do me next! mine's 891899. Dec '79, Rev D voice boards. Caveat: possibly. General consensus AFAIK is that the first two digits indicate production period - add one per month, wrap-around to 00 after 99. 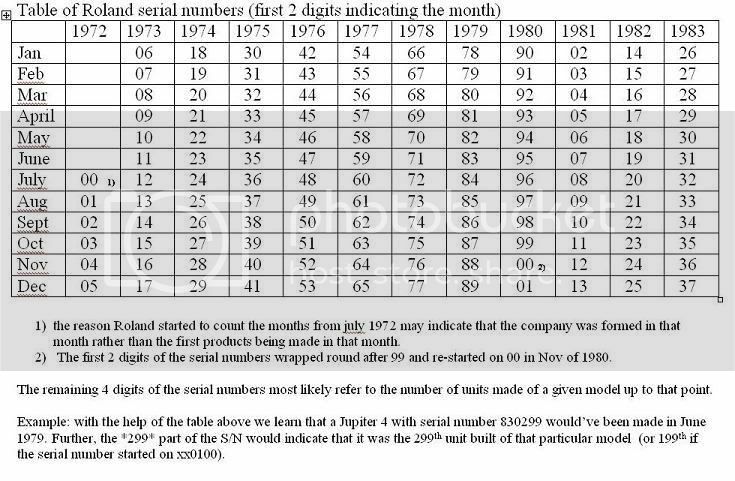 The other four digits are possibly the general serial number of the unit, but there are some discrepancies that crop up in observed serial numbers that don't always fit this analysis, so it's a best-guess scenario. There were changes to the filter IC: up to and including D, the filter used 4x BA662 OTAs, from E it was the IR3109 (which is 4 OTAs in a package, basically). Other changes were made too, and there are little tweaks all over the schematics. fastfwdd wrote: My serial is 034016. I'm not sure how to place it. Here's a table drawn up by one of our members a while ago that seems to hold good. Roland changed their serial number system around 1989-ish, so this sytem only applies so far. Also, going back to the start, some things do not have a serial one would expect. From what I've seen, mostly this is the case on Boss products rather than strictly Roland, but it's something to bear in mind. If you want to decode Boss serial numbers try the Bossarea decoder. It works for most, but occasional entries throw up incorrect dates. Common sense applies. Steve Jones wrote: my heart sinks every time one comes into the shop. Not saying this to put you off, I am saying it to encourage you to find a well looked after, late serial number unit. I have my uncle's old Jupiter-4 (august '79) down in the lab at work to see what I can do for it. It's behaving strangely and I dont know where to start except changing lytes. Did check the noise level of all signal from the power board though, nothing was more than in the mV range.